These are no ordinary watering holes. Think taxidermy unicorns, nineties music and lots and lots of crazy cocktails. 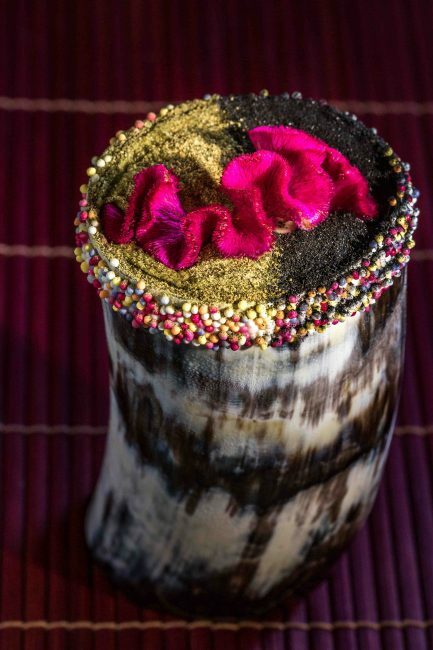 These are London’s quirkiest bars. The exterior of this wonderfully dark east London hotspot doesn’t give much away, but step in through the doors and be welcomed by the friendly staff into a fantastically esoteric and well-run cocktail bar. There’s taxidermy all over the place and even a unicorn skeleton. Mainly, this is a place that does fantastic drinks. You get what you pay for with specially made, boozy cocktails including the Satan’s Manhattan, which like the bar itself is small, but packs a punch. This faux colonial rum bar is just pulsing with character. Settle in for rum and cocktails among the flowery wallpaper and quirky old style knick-knacks, like vintage sewing machines. With tasty treats to nibble like jerk chicken and empanadas, you’re transported to another world. One of the City’s best kept secrets, this underground cocktail bunker is a haven for city boys and hipsters alike. There’s a creative and unusual cocktail list, gourmet toasties and cheese and charcuterie boards to keep you going. This is a place run by people who are passionate about hospitality and will happily talk you through the drink they are lovingly shaking up for you. Another bird-themed winner from the team behind Nightjar. Make sure to book a table to ensure a seat to enjoy the slightly tropical, exclusive-feeling cocktail spot. The drinks are not cheap, but they are nothing if not creative. Think botanical bits and bobs being set alight on top of your drink and herby and boozy ingredients you would never think to put together. The immaculately glinting bar is surrounded by jungle wallpaper and if you stay late enough, you’ll be able to catch some live music too. Step into the prohibition era with this secret spot hidden between a Nando’s and a dry cleaners. It’s hard to spot from the street, so you’re guaranteed that anyone you meet in there is in the know. The interior boasts bare brick walls and vintage photography, all warmly lit by copper lamps and candles. The other retro details include an old fashioned till, gramophone and an exclusively jazz era playlist. Even the staff are dressed in quirky 1930s style get up. Another period piece, although which era isn’t exactly clear. The bar staff dress in flat caps and waistcoats and the vintage touches across the room bring to mind an eclectic mix of the Victorian, Edwardian and Colonial. As well as a very individual set of complex and carefully thought-out cocktails, there is delicious food on offer and live music on a Sunday night. A real blast from the past. With a grand hall behind a secret door and a secret vault, this underground Victorian-themed bar is not about understatement. The story behind the name comes from a Victorian scallywag whose last wish before being hanged was to have a drink in one of London’s brew houses. Believe it or not, he managed to escape and along with gaining his freedom, he provided this dimly lit gentleman’s club style bar with an intriguing name. There’s an excellent selection of cocktails and a daily happy hour between 5pm and 7pm. When you need to sober up, it’s time to grab one of their tasty (non Victorian) pizzas. You could walk past this place and never realise what it is. 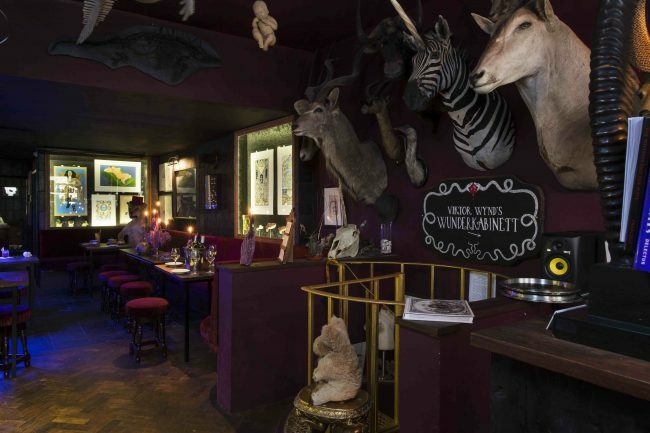 With crazy knick-knacks, taxidermy and freaky oddities, it’s as if the The Viktor Wynd Museum of Curiosities, Fine Art and Natural History has outgrown its space and started to spill artifacts up into the bar. Not for the faint of heart, there’s a whole menu devoted to absinthe, two pages of cocktails and a selection of wine and beer. While you’d find it hard to cobble together a whole meal here, there are a tasty selection of bar snacks and nibbles to stop you falling off your stool. This fantastically trashy niche of kitch nineties memorabilia located in the vaults beneath the Rio Cinema certainly stands out from the crowd. Book yourself in for a two hour slot, drink teapots of booze and gobble down popcorn and pic’n’mix sweets to your heart’s content. There’s a prop room with giant glasses, wigs and the like, so when the nineties pop music takes over your soul, it’s time to get up, get kitted out and seriously spice up your life. Surrounded by vintage circus posters, and sitting on a Rubix cube stool, you’ll wonder just exactly what kind of looking glass you stepped through to find yourself at Cirque. There are also zebras/unicorns and model planes dotted about the place, giving it a kind of madcap Fear And Loathing feel. The cocktails are cold and the dance floor is always packed, so after overcoming the initial shock to the senses, you’ll certainly want to run away with this circus. You’d never expect to find this crazy and crowded Tiki bar halfway down a market street in Dalston, but here it is. Inside, it’s bright, kitsch and tropical, and punters and staff alike are infectiously friendly. The DJ booth at the back keeps the dance floor jumping into the early hours and the reasonably priced cocktails flow freely. Hot and sticky good clean-ish fun.